Dr. Frank Luce brought his family to settle in Morrison after losing their Denver home in the Silver Panic of 1893. He built a home on South Park Avenue, but later moved to the Abbo house at the corner of Park and Canon. 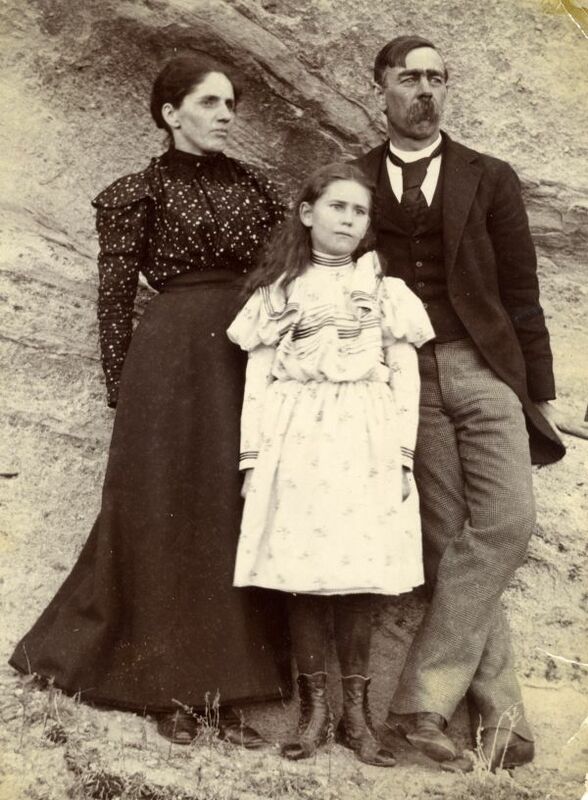 Dr. Luce poses with his wife Belle Crowther Luce and daughter Emily Luce at Red Rocks, in this photograph, probably taken soon after their move to Morrison. Courtesy Jacqueline Luce Baldessari. Dr. Luce used a horse-and-buggy for most of his house calls. According to family members, he had an automobile for a short time late in his career, but soon reverted to this traditional means of transportation. Dr. Luce constructed trout ponds in the backyard of the Canon Street house (now Horton House Bed & Breakfast); they were flooded and filled with debris during the floods of the 1930s. Until about 1940, he served as Morrison’s only doctor, attending his patients in his home office or making house calls. Images and text on this site are copyright by the Morrison Historical Society, Lila Horton, or S.L. White unless otherwise indicated. Contact the MHS for information on use.